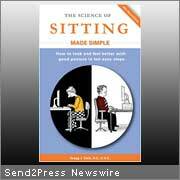 “The Science of Sitting Made Simple” is written with the average person in mind and the ever present need to stem the rapidly growing, worldwide epidemic, of preventable posture-related health problems. This practical book features 10 easy steps to help people look and feel better through good posture. Material is presented to guide readers to greater well being, a more youthful appearance, and a lifetime of pain-free service from their spines. Dr. Carb has included dozens of illustrations, easy-to-understand instructions, clear-cut posture tips, brief exercises, and stretches to start everyone on their way to better posture and spinal health. A handy step-by-step ergonomic tune-up is also included as part of a simple posture improvement plan. It is ideal for people who can only devote a limited amount of time and effort to learning about and practicing good-posture techniques. As an added feature, the appendix section provides greater depth, details, and insights into the subject of sitting posture, injury prevention and winning the battle with back pain. Dr. Carb is a Certified Associate Ergonomist who started his chiropractic clinical practice in San Francisco at the dawn of the personal computer age in 1985. He has since treated thousands of postural strain-related injuries. After many years of counseling a large patient population of desk workers, he developed a series of simple steps to help explain and improve posture awareness for everyone. Dr. Carb’s book is available from retail and Web bookstores. For more information, visit: http://www.posturepress.com.